Today Freightos announced a $25 million dollar funding round, led by GE Ventures. In the five years since Freightos launched, logistics and technology have increasingly converged. At JOC’s TPM in Long Beach last month, no less than fifteen sessions featured technology, digitalization, and freight future-proofing. The venture capital industry is a key player in driving freight digitalization. 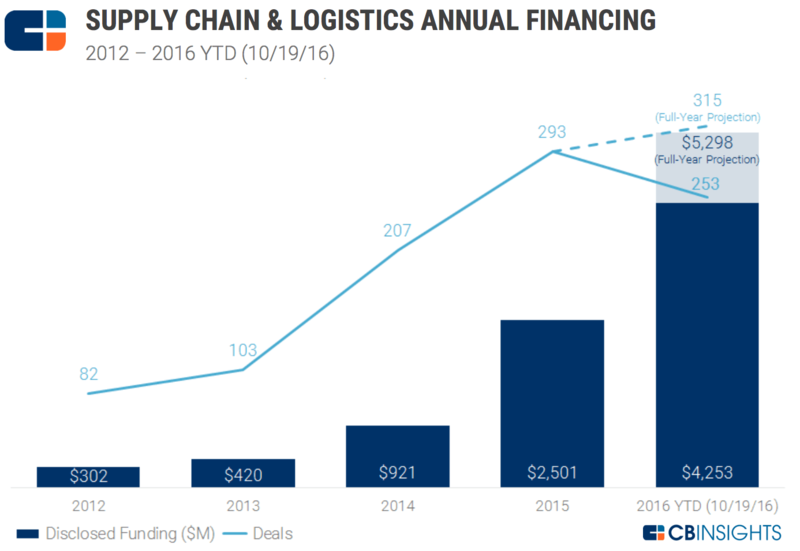 According to CB Insight research, supply chain technology funding skyrocketed in 2016, reaching over $5 billion dollars, more than 10X 2013 levels, and creating more logistics startups every year. So we spoke to some of Freightos’ investors to see what drew them to logistics (and, of course, Freightos specifically). Urbanization, population growth, aging infrastructure, and climate change all put tremendous strain on the “business as usual” model, so large international markets demand more efficient, cost-effective, and sustainable business models. Freightos provides large global shippers with the transparency and information required to lower not only direct costs, but also, through Freightos’ carbon footprint calculator, indirect costs to the environment from the transportation modes and trade routes they choose. We like hard problems that help big global customers and industries. We also like to invest in entrepreneurs who tackle big challenges – ones that increase transparency, improve convenience, take costs out of the system, and are data intensive. Logistics checks all of those boxes. This is the reasoning behind Aleph’s logistics tech spree. In only three years, the VC has already accumulated four logistics and transportation companies in its portfolio (Freightos, Bringg, Windward, and Nexar). What does Michael think all four companies have in common? They are all founded by ambitious entrepreneurs, tackling challenges that most people find intimidating. We also believe that data is the foundation of all 21st century business; he who has the data will win in the 21st century. All of our logistics investment focus heavily on data collection and analytics. GE is a global shipper with large business tied to shipping, as well as a logistics business. The larger theme of freight digitalization is a strong strategic complement for General Electric’s role as the world’s leading digital industrial company. Large addressable market: Investments are by nature risky so it’s important to maximize potential payoff of successful companies. Winners, not winner, take all: Large markets create opportunities for multiple players to succeed. In passenger travel, for example, dozens of companies have made it huge, while new travel tech companies emerge regularly. The scope and breadth of the logistics industry means that these two conditions exist in spades. According to Mylod, the pain points that typified travel twenty-five years ago – insufficient digitalization and a market demand for increased efficiency – are evident in logistics. One mantra for marketplaces that enable price discovery is that while consumers – shippers in this case – do win, the sellers that successfully digitize operations can compensate for unit economic changes by increasing market share, just like Delta or Marriot did over the past twenty years. For global logistics, it’s a brave new world, where new technology players and incumbent enterprise providers can work together to improve the state of the industry. Working with over 1,000 global forwarders, strong marketplace traction, and the new round of funding, Freightos is excited to drive the change. Importing made simple with live rates from dozens of forwarders, online management, and 24×7 support.